Luna Lovegood sports her own Spectraspecs. Photos © Warner Bros. Pictures. All Rights Reserved. 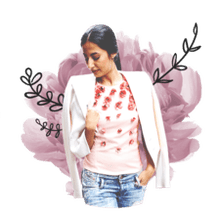 Learn how to print and make a pair of Spectrespecs just like the quirky Luna Lovegood from Harry Potter. If you're going for total authenticity, try printing this template on a piece of silver paper from the office store. Otherwise, regular printer paper or card stock will work just great. After you've cut out the pieces, we can cut the lenses. Cut two 2 1/2" circles from the plastic wrap, one in blue and the other in purple or pink. Your circles don't need to be perfect because the edges will be hidden by the glasses frame. Now, we'll glue the lenses in place. Make a thin ring of rubber cement or white glue around the lenses, then carefully press your plastic wrap circles in place. Next, we will attach the earpieces. Fold the edge of the earpieces and glue to the edge of the glasses. I suggest weighing down the glasses with a book while the earpieces set. 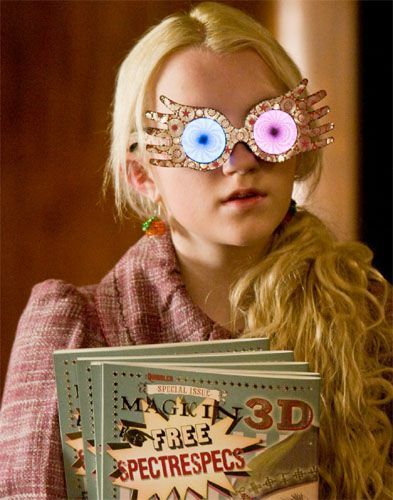 Now you've got a pair of Spectrespecs to complete your Luna Lovegood costume! You can also make Harry Potter glasses.